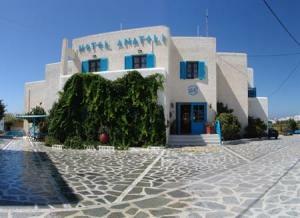 The Anatoli Hotel is situated at a privileged site on the Cycladic island of Naxos, a close distance from the pretty Agios Georgios beach. Delight in the family atmosphere and comfort of this hotel in the north-west of Naxos, in the island's main town of Chora. Amidst the town's traditional Cycladic charm you will find the harbour and various fish restaurants, taverns, cafes and bars. Overlooking the town is the Venetian castle, which can be seen from some of the hotel rooms. At the Anatoli you can take a swim or catch a few rays beside the outdoor swimming pool, or relax in the spacious and sunlit rooms, some of which have sea views. Bar, 24-hour Front Desk, Garden, Non-smoking Rooms, Family Rooms, Free Parking, Express Check-in/Check-out, Safety Deposit Box, Heating, Luggage Storage, Gay Friendly, Breakfast Buffet. Room Service, Airport Shuttle, Car Rental, Tour Desk, Fax/Photocopying.